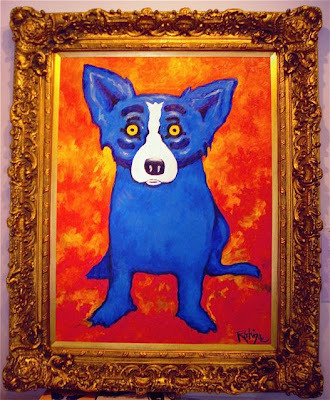 As long as I can remember, George Rodrigue has talked about his sporadic but serious interest in ‘painting to the frame,’ a phrase he coined himself as far as I can tell. 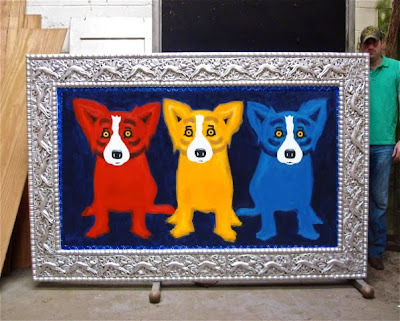 Although most of the time his paintings and frames are unrelated to each other (in fact, I recall him asking our framer, “Make the frame go away” so as not to distract from the painting), occasionally George comes across a frame that dictates the design, color, and even imagery on his canvas. 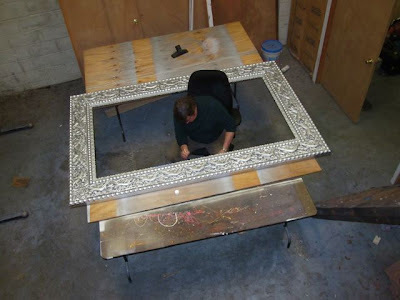 In some cases the frame was so interesting that George spent more time restoring it, often stripping paint, oiling the wood, or cleaning the details with small brushes, than he did on his painting. This is true of two small landscapes (11x14 inches each) from 1969. 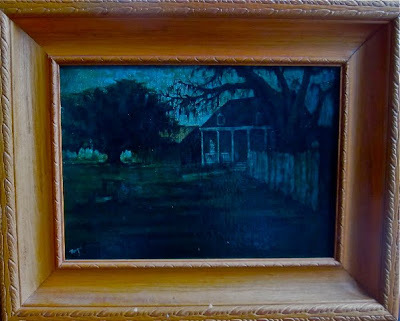 In both cases he painted his canvas to carved cypress frames that he had stripped of their gilding. 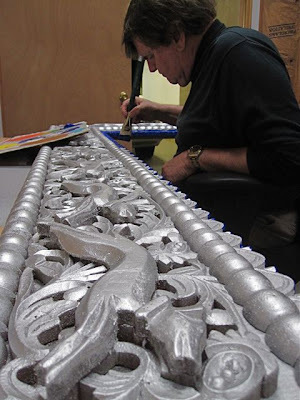 This was extremely labor intensive, and he used to work on the frames for days before beginning his painting. 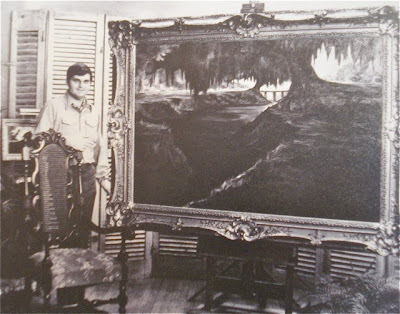 Rarely have I seen George as disappointed as when he purchased back the 1969 painting Bayou Country House (pictured below) at auction several years ago. 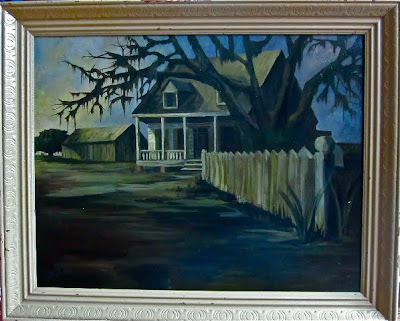 He had spent many hours stripping the 24x30 inch cypress wood before painting to the frame, and yet the man who originally bought the work (for $150!) applied a pale grey house paint, which he felt better matched the oil painting. Although it would be easy today to pay to have this paint removed (and in fact we did have the painting itself restored by a conservator recently), it hangs as is on our living room wall, a reminder of struggles with clients and their preferences; a reminder that the art takes on a life of its own, depending on where it hangs and how it's studied and talked about, beyond the artist and his intent. That said, it wouldn’t surprise me to find George sitting at the dining room table, deep in thought, stripping the paint himself late one night. 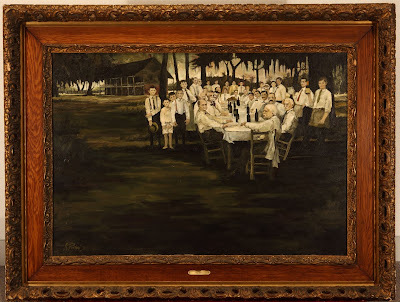 George’s most famous image painted to the frame is the Aioli Dinner (1971). 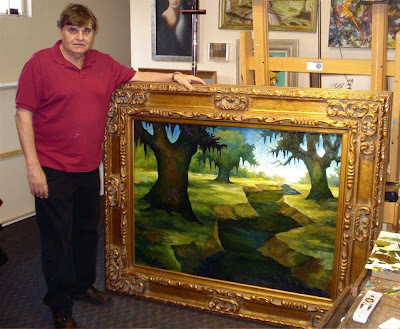 He found this 32x46 inch frame at Bob’s Junk Shop in Lafayette, Louisiana, and it inspired both the size and greenish color of the painting (for the history of this painting visit its post; to see the painting with frame in person, visit the New Orleans of Museum of Art, where it hangs currently at the top of the Grand Staircase, to the right). Although shadows make it difficult to see in a photograph (even one as excellent as this, courtesy of Judy Cooper at NOMA), one side of the frame is considerably darker than the other. This is because when George found it, the frame held a vertical portrait (a photograph, under glass, of President McKinley), and the dirt gathered on one edge for decades before he turned the canvas horizontal for his purposes. 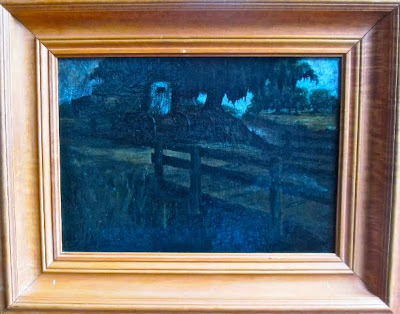 To many, the notion of ‘painting to the frame’ (as well as the notion of writing or reading about it) may sound boring. However, it is another reminder of George’s inventiveness and, most endearing to my mind, his inherent and natural devotion to his own rules of painting (hard edges, graphic interpretations of his culture, strong design, repetitive imagery, etc; for details, visit any of the Blue Dog or Cajun entries listed under 'Popular Musings' to the right of this post) ---- the same rules he set for himself more than forty years ago. The same can be said for George in life, actually, and I believe it’s the reason he’s described so often as down-to-earth. Not only is he still painting to the frame, he’s also still reciting the Eagle Scout creed…. 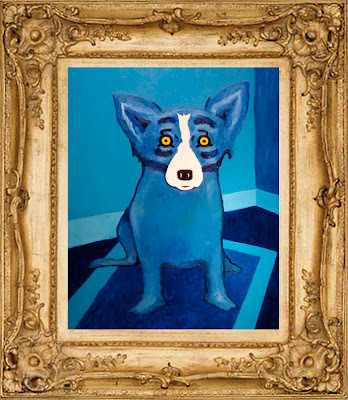 So why did he wait five years to paint to the running-dogs frame? Well, he had nowhere to hang an eight-foot, eighty pound picture, and let’s face it, it’s just not any fun if he can’t show it off! But as he paints for the new 3,000 square foot gallery on Royal Street, size is no longer an issue. He has room to install almost anything, and you can expect to see (or not see) not only invisible, contemporary moldings, but also gilded, ornate, antique frames, and of course, running dogs.